Irish note cards feature a gold foil Trinity knot. These Celtic knot cards are ideal for a note along with invitations and thank you. These Celtic cards feature an embossed Trinity knot with a gold foil motif; they are blank inside for your personal message. The Trinity knot cards are made of heavy stock and measure 5” wide x 3 1/2” tall; each box contains 10 beveled-edged cards and envelops. 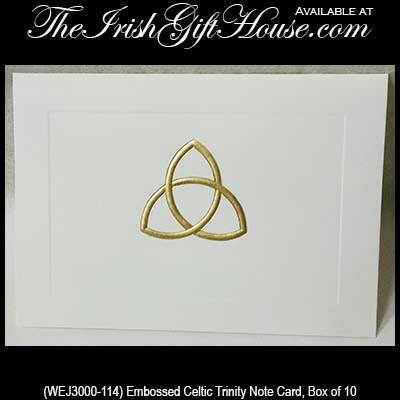 The Trinity notes are made in United States and included a Celtic knot history card, complements of The Irish Gift House. May the road rise to meet you. May God hold you in the palm of His hand. Celtic note cards feature an embossed knot-work motif. Irish thank you cards feature embossed Celtic knot-work. Irish note cards feature a traditional blessing along with shamrocks.